The Sonic Key Finder ends hours of hopelessly searching for your keys. All you need to do is clap, whistle or shout. 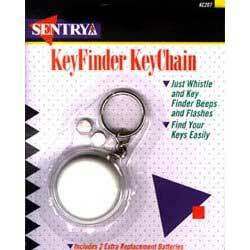 Any loud noise causes the Key Finder to beep and the light to flash. Also handy for finding keyholes. Uses 2 small button batteries - includes 2 extra batteries.